Symbiosis International University is a deemed university offering various courses in different domains. The university conducted an entrance test in the name Symbiosis Entrance Test, in short known as SET for the candidates willing to seek admission in engineering and technology. Symbiosis SET 2019 is conducted to check the suitability criteria of the students to seek admission in engineering course. The entrance exam is conducted on online mode and the candidates can register by logging into Symbiosis International University official website. The below mentioned article provides the completed details regarding the SET 2019. The details regarding schedule, admission process, exam pattern, syllabus, counseling, etc. Symbiosis SET 2019 will be conducted in the month of May 2019 for the academic year 2019-2020. In the below mentioned table, the complete schedule of SET 2019 is mentioned including registration dates, admission dates, exam date, result declaration date, etc. Symbiosis International University has set certain eligibility criteria for the students willing to appear for SET 2019 considering the eligibility for admission. The eligibility criteria consist of requirements like age factor, qualification, nationality, required score, etc. Aspirants with more than 40% physical disability. Age: SET 2019 have set no age restriction for candidates appearing for the test. Educational Qualification: Candidate’s appearing for SET 2019 should attain a minimum of 45% aggregate score in 12th in the mandatory subjects like Physics, Chemistry, English and Mathematics/Biology. Reservation: SET 2019 provide reservation for the candidates with more than 40% physical disability. 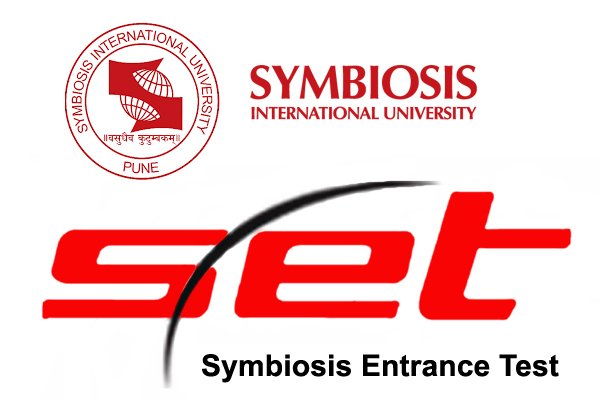 SET 2019 application from will be available from the official website of Symbiosis International University. Candidates can apply for the entrance exam through online mode to seek admission in the institute. The admission will be based on the score obtain in the entrance exam followed by counseling process. Visit SET 2019 official website and navigate to New Registration. Fill up the application form and upload the scanned documents. Make the payment and submit the application form. Candidates can take out the print out of the duly filled application form for future use. 10th and 12th marks sheet. SET 2019 application from will be available only through online mode from its official website. SET 2019 Application form has to be submitted on time before the last date. Delayed application forms will not be considered by the authorities. Fee payment can be made through demand draft from any of the nationalized bank, addressing to the "Symbiosis Test Secretariat". The fee payment made by the candidates for SET 2019 is non-refundable under any circumstances. Symbiosis International University has customized its SET 2019 test paper based on various factors. The exam pattern mentioned below gives the complete details for the students appearing for the entrance examination and guides them to prepare for the exam in a much better way. Mode of Exam: Symbiosis University conducts SET 2019 through online mode. Medium of Exam: SET 2019 will be conducted only in English medium language. Duration of Exam: SET 2019 will be conducted for 150 minutes, i.e., for 2 hours 30 minutes. Subjects: SET 2019 paper will consists of Physics, Chemistry, General English and Mathematics subjects. Format: SET 2019 is an objective type paper. The question consists of multiple choice questions. Marking Scheme: Every correct answer given by the candidates in SET 2019 will gain 2 marks. Whereas wrong answer and unanswered question does not lose any mark. Total Marks: Symbiosis International University has set the SET 2019 paper for total 200 marks. Symbiosis International University conducted SET 2019 based on the syllabus of class 11th and 12th. The subjects like Physics, Chemistry, English and Mathematics are included in the syllabus. Few topics covered under the syllabus are jotted down for the student’s reference. Physics: Electrostatics, Current Electricity, Magnetic Effect of Current & Magnetism, Electromagnetic Induction & Alternating Current, Electromagnetic Waves, Optics, Dual Nature of Matter, Atoms & Nuclei, Electronic Devices, Communication Systems, etc. Chemistry: Solid State, Solutions, Electrochemistry, Chemical Kinetics, Surface Chemistry, General Principles and Processes of Isolation of Elements, p Block Elements, d and f Block Elements, Biomolecules, Polymers, Chemistry in Everyday life, etc. Mathematics: Relations and Functions, Algebra, Calculus, Vectors and Three-Dimensional Geometry, Linear Programming, Probability, etc. Admit Card of Hall Ticket for the SET 2019 entrance test will be issued by the admission authorities of Symbiosis International University. The admit card will be released online, and candidates appearing for the entrance test can download it by logging in from their login Id and password. Visit SET 2019 official website and navigate to Admit Card link. Provide the registration number and password and click submit. Once the admit card is displayed download and take the printout. SET 2019 results will be declared by the admission authorities of Symbiosis International University through its official website. Candidates can access their results by logging in using their Id and password. Candidates can download their score card for the further usage. Visit the SET 2019 official website and navigate to Results. Login using the Id and password provided. Once the result is displayed download and take a print out of the score card. SET 2019 Counseling will be conducted by the Symbiosis University admission authorities. The counseling will be held soon after the declaration of results followed by seat allotment process. Candidates appeared for the entrance test should be present physically present at the counseling centers on the scheduled date and time.